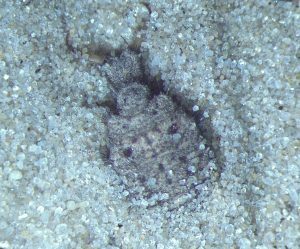 Antlion larvae hiding in their sand pits detect sand vibrations just a fraction of a nanometer in size. These vibrations inform the antlion of an approaching ant, and they respond by throwing sand to prevent prey from escaping their sand pits. Most arthropods use some form of sensory hair to detect vibrations, and some species, among them scorpions and spiders, have been shown to use surface vibrations to detect approaching prey. Antlion larvae build conical pits in granular earth and bury themselves at the bottom, waiting for smaller insects to fall in—towards their waiting jaws. Antlion larvae are covered in sensory bristles that allow them to detect the vibrations of walking ants up to 20 cm away. The surface vibrations produced by a walking ant are extremely small and remain in the sub-nanometer range while the ant is outside of the antlion’s pit. In this study the vibration patterns of a walking ant were recorded and ‘played back’ to antlion larvae at intensities ranging from 1/10 of a nanometer to 50 nanometers, using a piezoelectric transducer. Antlions have previously been shown to respond to nearby ants by throwing sand, after a delay that can amount to several minutes while the larva waits for its prey to get closer. This sand is thought to trigger and enhance tiny avalanches that hinder escape attempts. 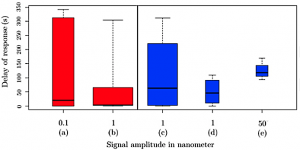 In this study, the authors show that not only can antlion larvae detect and respond to vibrations smaller than a nanometer, these sub-nanometer vibrations prime the larva to respond faster and more often to nanometer-scale vibrations—presumably because this pattern is indicative of an ant walking-towards and then falling-into their pit. Might the rare and delayed responses to 50 nm stimuli suggest they are interpreted as larger, less appropriate prey? Are these distinctive vibration patterns learnt or do the antlions have an inherent bias towards ‘ant-walking’ vibrations?